If you suffer from insomnia, as I do, and you’re tired of taking everything from Nyquil to Melatonin, then Full Extract Oil (FEO) just might be the solution for you. To give you some background, RSO, which is an abbreviation for Rick Simpson Oil, was used to help with the treatment of many ailments and diseases. Rick Simpson, an engineer who began cultivating cannabis to help treat his skin cancer, saw a significant improvement in his health after several days of applying highly concentrated cannabis oil onto his skin. Simpson then formulated his very own cannabis concentrate, known as RSO. Now that we are out of cannabis prohibition, modern laboratories have refined the process, and the concentrate is now referred to as Full Extract Oil (FEO). You’re probably wondering how FEO is made. The process usually consists of cannabis flowers being grinded down and washed in a solvent such as alcohol. After the alcohol evaporates and the remnants are filtered several times, you’re left with highly concentrated cannabis oil that ranges from 20%-90% THC and about 10%-70% CBD. Cannabidiol, abbreviated as CBD, is a non-intoxicating molecule of the cannabis plant, leaving you medicated without the intoxication. There are many companies that produce Full Extract Oil. One brand I particularly enjoy is the Cookies N’ Cream with BAOx CBD full extract oil from Chronic Creations, based out of Sandy, OR. Chronic Creations believes in full spectrum extraction, meaning they use the whole cannabis plant for maximum medicinal benefits. The company also uses top-quality organic cane alcohol that is tripled-mineral filtered to remove any impurities left in the oil, making it tastier than most brands. 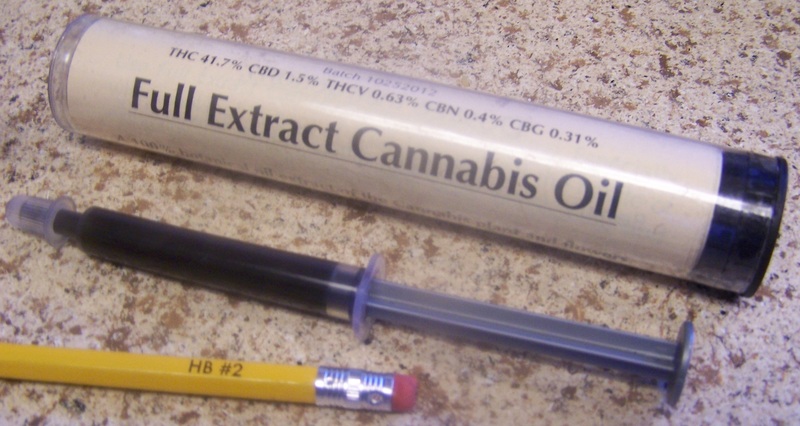 This oil is very potent, it is sold by the gram which is then compressed into a syringe. The test results for this particular batch, resulted in 524.4 mg of THC and 204.0 mg of CBD. The company recommends starting with a dose that measures to be about half a grain of rice, which gives you a serving of 26.22 mg of THC and 10.2 mg of CBD; adjust accordingly if your tolerance is higher. Don’t get overconfident like I did, and give yourself four times the recommended starting dosage–I became one with the couch for almost a whole day! This product has been helping me sleep a full eight hours without waking up in the middle of the night. I’ve been feeling so rested and mellow, it’s almost as if I’m walking on clouds. Treating my insomnia without pharmaceuticals has been such a relief. I usually take a dose of FEO about two hours before going to bed. My favorite part is the anticipation of when you start to feel the oil take effect, then you slowly begin to drift off into a relaxing, peaceful slumber that leaves you with a cozy smile on your face. You can use Full Extract Oil as a topical or you can ingest it orally but if you don’t like the taste, adding it to your favorite recipes to mask the flavor is always an option. Chronic Creations does have other products available with less THC and higher CBD, so if you’re sensitive to THC, alternative options are available to help fit your needs. So stop by Bridge City Collective today and have one of our awesome budtenders educate you more on the products we have available in store. There are two locations to choose from, conveniently located in Southeast and in North Portland.